Monks at Clear Creek: no lack of vocations here! In my post “Divergent Political Models in the Two ‘Forms’ of the Roman Rite,” I argued that people who bring a well-developed life of faith to the Novus Ordo are equipped to derive spiritual benefit from it, while those who attend the traditional Latin Mass are confronted by a strong and definite spirituality that drives them deeper into the mysteries of faith and the exercise of theological virtues. The new form is a loosely-demarcated playing field for liturgical intramurals, whereas the old form is an ascetical-mystical bootcamp through which soldiers of the Lord are driven. The former presupposes virtue; the latter produces it. Can we find any external confirmation that this analysis is correct? All these motives are truly good, and the Lord wants to use them all. 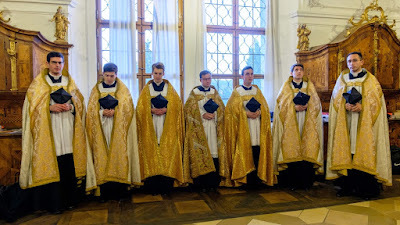 But it is still noteworthy that the Novus Ordo is rarely the powerful magnet that draws them in; it is a thing that people who are already drawn in for other reasons will go ahead and do as a regular prayer service. It’s the difference between relying on a neighbor for help and falling in love. Young people today rely for help on the Novus Ordo; they fall in love with the traditional liturgy. Or it is like the difference between acting from duty and acting from delight. We dutifully attend the Novus Ordo because it’s seen as “good for us,” like oatmeal; we get excited when the Latin Mass is available, because it’s delicious to the spiritual palate. Perhaps readers may object that I am exaggerating the contrast. It may be that I am. But I can only speak from my own experience, as well as from conversations I’ve had as a teacher, choirmaster, or pilgrim with hundreds of young people over the past twenty years. There seems to me to be a vast difference in the perception of the attractiveness or desirability of the old liturgy versus that of the new — so much so that if a Catholic college or university wished to increase daily Mass attendance, all they would have to do is to provide the old Mass, or to provide it more frequently, and the number of communicants would significantly increase. It might seem utterly counterintuitive, and yet it is borne out again and again at chaplaincies across the world. The reformed liturgy in its Genevan simplicity has never won any awards for seductiveness. It can barely be looked at head on before people feel embarrassed about its nakedness and try to clothe it with every accoutrement they can find or invent. We have to bring to it a devotion or a seriousness of purpose that we ourselves possess, if we are going to be in a position to benefit from the divine sacrament it spartanly houses. Without love of the Lord presupposed, this would be a wearisome, unrewarding business, rather like having to convince an indifferent person to be friends with you. It’s an uphill battle from the start. Why should young people be interested in something that is so boringly lecture-like, so logical and efficient, or so much in need of artificial sweeteners, like sacro-pop music? Most of them would rather be anywhere else. In attempting to understand how liturgy helps or hinders priestly and religious vocations, we should also take into account the demands of active life and contemplative life. Religious communities nowadays tend strongly in the direction of the active life, with apostolates in the world. As Dom Chautard and others have pointed out, modern people are strongly tempted to fall for the “heresy of activism,” whereby we believe that by our hard work we will bring about the kingdom of God on earth. Liberation Theology is an extreme example of the same tendency, but it has been at work since at least the heresy of Americanism diagnosed by Leo XIII in Testem Benevolentiae, according to which the so-called “active virtues” of work in the world have surpassed in worth and relevance the so-called “passive virtues” of religious and contemplative life. Since the Novus Ordo valorizes the active and denigrates the passive, it seems to fit well with the activist or Americanist mentality. Thus it seems that active religious orders could find it somehow amenable, as long as they could keep bringing to it an interior life cultivated largely through other means. But the priesthood, which must be rooted in the mysteries of the altar in order to remain strong and fruitful, and the contemplative religious life, which focuses on offering up the sacrifice of praise and not on an external apostolate, cannot flourish on a subsistence diet. What may seem “good enough” for the laborer in the vineyard is perilously inadequate for the priest and the contemplative, who need a truly sacerdotal and contemplative liturgy if they are fully to realize their great callings. 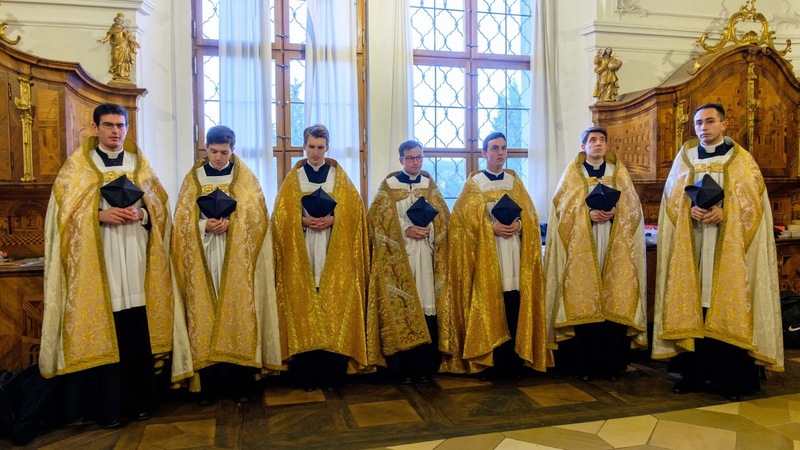 This is why we see everywhere across the world that serious priests and contemplatives will either “traditionalize” the Novus Ordo as much as they can, or adopt the traditional Mass and Office, or both. Examples of this variety of tradition-friendly approaches may be found in communities such as the Abbey of St. Joseph de Clairval, the Canons Regular of St. John Cantius, the Community of St. Martin, and the monks of Norcia, Fontgombault, Clear Creek, and Heiligenkreuz. Am I saying, then, that the (relatively few) healthy religious communities that use the Novus Ordo would be even better off with the Vetus Ordo? Yes, absolutely. The good they have would be multiplied, their power of attraction and intercession greatly intensified. 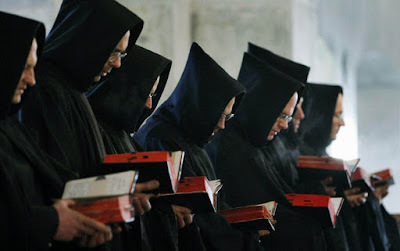 Unfortunately, however, even those who have come to recognize the superiority of tradition will be discouraged by the hostile climate introduced under this pontificate from returning to the Church's authentic lex orandi, lest they suffer the fate of the Franciscan Friars of the Immaculate or the Trappists of Mariawald. In this official opposition to the desperately-needed restoration of Catholic tradition we can see the telltale signs of the Devil's implacable hatred for the celibate priesthood and the contemplative religious life. But neither human nor angelic opposition should prevent any community from quietly and judiciously incorporating the traditional liturgy into its daily life. “Here is a call for the endurance and faith of the saints” (Rev 13:10). The ancient Latin liturgical rites and uses have nourished the saints of the Western Church for over 1,600 years. They have an imperishable power to do the same for all the saints Our Lord desires to raise up today. 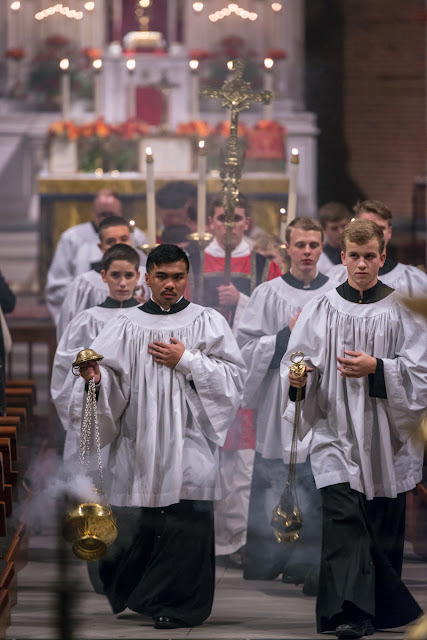 Traditional liturgy never failed to attract vocations of every kind or to support the Christian life of the laity; it continues to exercise the same fascination and fortification among us. The new-fangled liturgical rite of yesterday, like the Americanist world in which it was inculturated, is failing. A healthier Church, a healthier spiritual polity, is in the making.